Earn $3.19 in Rewards credit. Click to learn more. Don't let your workout go to waste by skimping out your recovery. 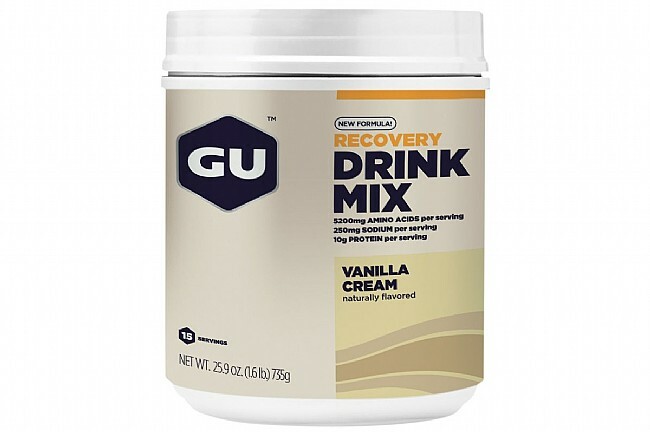 GU has formulated their Recovery Drink Mix to keep your body on point so not only can you get the most gains from your training, but you can maintain your overall health so you're always ready for the next round of riding. The 3:1 carbohydrate-to-protein ratio is composed of 10 g of whey protein isolate per serving, Arginine and Glutamine amino acids, and a mix of simple and complex carbs. Re-formulated for easier mixing and less clumping, drop a scoop of GU's Recovery Mix into water or milk to reduce muscle breakdown, promote new muscle development, boost blood circulation, and bolster your immune system. Available in multiple flavors. 15 serving container.